WatchGnome offers Guess fast watch battery replacement and makes it fast, easy and affordable. Unlike other watch shops, WatchGnome handles the whole process for you without you having to leave your house. 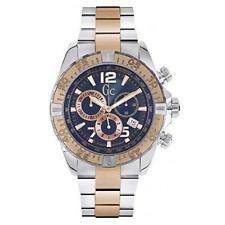 We specialize in Guess Watches and our technicians are very experienced with these classy and popular watches. You'll get your Guess back in just a few days without ever having to leave your house! Guess Watches launched its watch collection in 1983 with a line of men’s and women’s fashion timepieces. Consistent with the Guess standard brand image, the ever evolving watches are designed to appeal to young, fashion-driven consumers around the world. Guess offers constant attention to new ideas and cutting-edge designs to keep the brand exciting and relevant to today’s trends. They are frequently adding new styles to their watch collections. Guess Watches offer a wide range of styles for both men and women. The timepieces for women feature styles that range from trendy-casual all the way to sophisticated. The collection for men encompasses the best of masculine design, materials, and performance. WatchGnome is proud to offer Guess watch battery replacement. We love their products and are always excited to see one arrive in our mail order watch battery replacement boxes! How Much Does A New Guess Battery Cost? A new Guess battery and professional service to change it will run you between $15 and $60 depending on who you choose. Your local "battery guy" might do it for about $15, but just beware their level of experience. No Hassle Mail Service: With other companies you have to go to them. With Watch Gnome, we come to you to service your Guess. We are the true definition of Door-to-door Guess watch servicing. Complete Service Options: Does your watch need more than just a new battery? Maybe a cracked crystal on your Guess watch that need to be repaired? Don't worry - we can handle that too. Watch Gnome's online watch battery service starts at $20 for our standard service and our full service that includes shipping in all directions and packaging is only $30. Who Replaces Guess Batteries Near Me? For Guess battery replacement and repair, it doesn't get any closer to you than Watch Gnome. Our online battery replacement service will literally come to your door (via the USPS). When you order our service - we ship a padded watch box right to your home or office. You'll get your watch repair kit in 2-3 days. We've located our office and workshop in Denver Colorado because it's a main USPS hub and we can get to your home in 2-3 days without a problem. Guess watch battery replacement right next door!